I’m meant to be studying for exams right now which means two things, I am doing a small bit of study, not as much as I should be and I am browsing the internet more than ever. Internet usage and exam periods have a direct relationship I am sure, maybe I’ll research that and write a thesis on it! As you can imagine I haven’t been out fishing, the weather has been awful anyway, and I haven’t been out casting so you will have to settle with some amazing timelapses I have found on the internet. Whilst searching for various examples of video quality of a few cameras I am looking at, I stumbled across the work of Terje Sorgjerd aka TSO Photography on vimeo. His work is simply stunning, the most impressive collection of timelapse videos I have ever seen. Without further a do here is one example and a link to his vimeo page. This is his Aurora timelapse but the others are also mind blowing, especially “The Mountain” – check them out and enjoy! Well that covers the underwater, point of view, skiing, general risky situation shots so now for something to create a bit of cinematic effect. The Canon EOS 550D is looking like a good choice, it’s a bit of an older model now so heavily discounted but still packs a punch. I also have a couple of older Canon lenses lying around that could be used with it, another big plus. I was looking at DSLRs a while ago so maybe I’ll take the plunge and just get one, if I do be prepared for some killer movies once I get the hang of it! Next season’s plans are up in the air at the moment, a lot to think of and a lot of saving to do but currently in the thought process is USA, NZ and Australia, possibly more. That’s a lot of fishing. 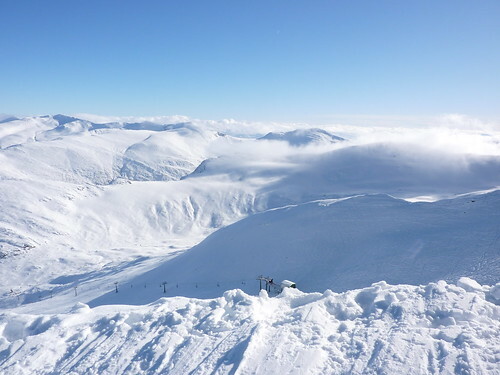 But before then there is a full ski season to concentrate on, the snow should be here anytime soon, in fact the Mountain Weather Information Service are forecasting a metre of snow over the Western highlands so Glencoe and Nevis could be in for a seriously good dump making the prospects of opening within a fortnight a real possibility… wax up those skis! 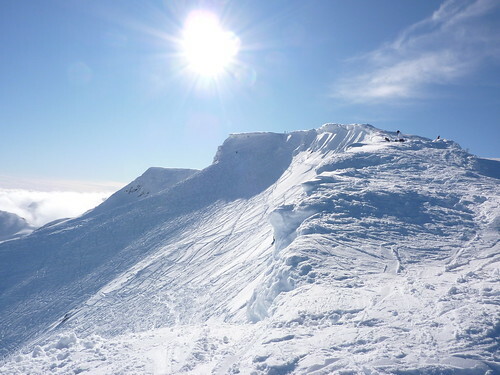 I’ll leave you with two pictures from February 2010, the first looking at Chancer in the back corries at Nevis, amazing run that day, drop in off the cornice just to the right of the sun, you can see one skiier on it – heaven! That was indeed awesome Marc!